As was to be expected, 4K was an even bigger focus this NAB than last year. 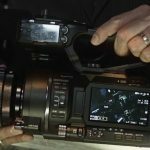 So we weren’t too surprised that JVC’s new GY-LS300 had 4K capability. What was surprising was the GY-LS300’s numerous other capabilities, such as HD streaming over wi-fi, new CMOS sensor, detachable accessories and more, all in such a small and affordable package. 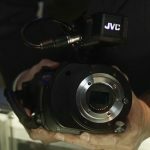 We talked with JVC’s Craig Yanagi about their awesome new camera and its many benefits. After hearing from their customers that they were interested in a small form camera that had pro-camcorder features, JVC spent about 2-3 years developing the versatile GY-LS300. It has a MFT lens mount, allowing for a wide variety of lenses to be attached. This comes heavily into play with the GY-LS300’s Variable Scan Mapping (VSM) which allows you to match the sensor scan size with the circumference of the lens. As Yanagi show in the video above, 4K uses 100% of the sensor, HD 80%, and even down to Super 16 size. There’s even an option in the VSM menu to meter each corner of the camera’s screen to make sure you aren’t getting a vignette with your lens. This currently the only camera with such capability. JVC is actually running an awesome special through September 2015. They are offering you either a Metabones lens adaptor (EF, Nikon, or PL ) or a 35mm Rokinon Prime lens to get you started. For all the features packed into the GY-LS300, as well as their additional special offer, it’s shocking that the price is only $3,995. It’s also available now, so for anyone looking for a great, feature full, compact camera, you should definitely check out the GY-LS300.